It is 1967. In separate wings of a Viennese hospital, two men lie bedridden. 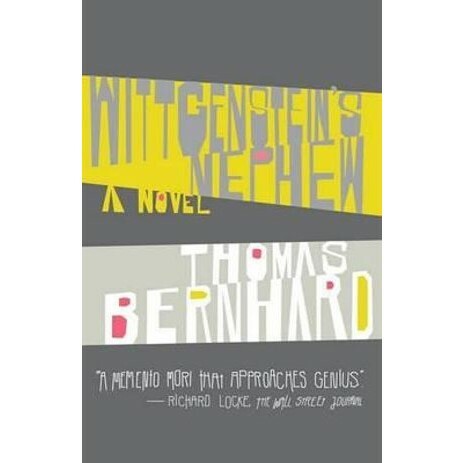 The narrator, named Thomas Bernhard, is stricken with a lung ailment; his friend Paul, nephew of the celebrated philosopher Ludwig Wittgenstein, is suffering from one of his periodic bouts of madness. As their once-casual friendship quickens, these two eccentric men begin to discover in each other a possible antidote to their feelings of hopelessness and mortality—a spiritual symmetry forged by their shared passion for music, strange sense of humor, disgust for bourgeois Vienna, and great fear in the face of death. Part memoir, part fiction, Wittgenstein’s Nephew is both a meditation on the artist’s struggle to maintain a solid foothold in a world gone incomprehensibly askew, and a stunning—if not haunting—eulogy to a real-life friendship.